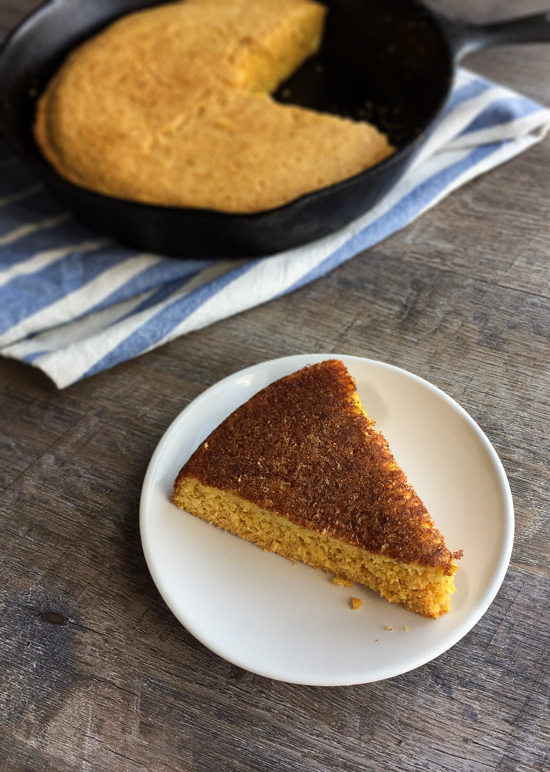 A cast iron skillet is the key to the deliciously crispy crust of this Skillet Cornbread. Serve it alongside a hot bowl of soup or chili for one hearty meal! Cornbread was something we had often when I was growing up, and it’s still one of my top comfort foods to this day. A big pot of pinto beans, fried potatoes, and hot cornbread with loads of butter was one of my favorite meals as a kid. Of course, my mom would usually add some green veggie like canned mustard greens to it and ruin what was an otherwise perfect meal. Ha! A cast iron skillet is the key to great cornbread. You will need to place it into the oven as it pre-heats so that the pan can get nice and hot. That’s how you develop that wonderfully crispy crust. The batter will sizzle as you pour it into the skillet. You can make this in a glass dish, but it won’t have that same crispy layer. If you do make this in a glass dish, skip the pre-heating step. The glass dish could break. Just grease the pan and pour the batter in and put it in the oven. There’s quite the debate amongst people on the addition of sugar to cornbread. Up North, cornbread is really sweet, like a dessert and more cake-like in texture. Many Texans and Southerners say sugar is a major no-no, but there are some who admit to using a bit of sugar. To me, a true Texas or Southern Cornbread recipe does NOT call for sugar. You can use yellow or white cornmeal for this recipe, but my Mom always used yellow, so that’s what I use and prefer taste-wise. Instead of the vegetable shortening many old traditional recipes call for, I use ghee (clarified butter because it’s a healthy fat that can handle high heat. You could also use bacon grease or some other type of high-heat oil if you prefer. My recipe does not call for any wheat flour because I wanted to create a gluten-free cornbread recipe. If you are gluten sensitive or celiac, look for a certified gluten-free cornmeal. My cornmeal of choice is Arrowhead Mills. It’s certified gluten-free and Organic. 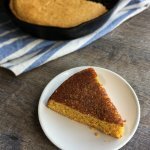 Whether you serve this Skillet Cornbread with soup or use it to make cornbread dressing during the holidays, it’s totally delicious! With a deliciously crispy crust, this Skillet Cornbread is perfect for serving alongside a hot bowl of soup or chili! Preheat oven to 450°F. Place 3 tbsp of ghee or other oil into cast iron skillet and place into oven while it preheats. In a large bowl, whisk together the cornmeal, baking soda, baking powder and sea salt. In a small bowl or liquid measuring cup, whisk the eggs and milk together. Pour the liquid ingredients into the cornmeal mixture and stir until just incorporated. Do not over mix. 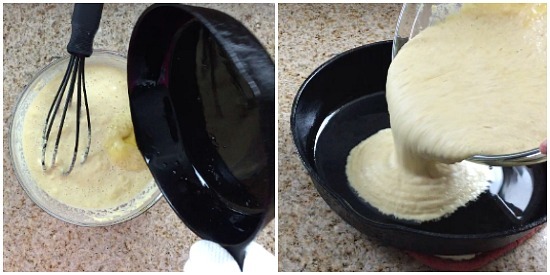 Remove the skillet from the oven and carefully swirl the oil in the pan so that it coats the bottom of the skillet. Pour all but about a 1/2 tbsp. of oil into the batter (it will sizzle), stirring until just combined, then pour batter into skillet. Place into oven and bake until a toothpick inserted into the middle comes out clean, 20-25 minutes. If you don't have buttermilk, add a tablespoon of fresh lemon juice to milk in a liquid measuring cup, then let sit for 3-4 minutes. It will turn acidic and curdle.